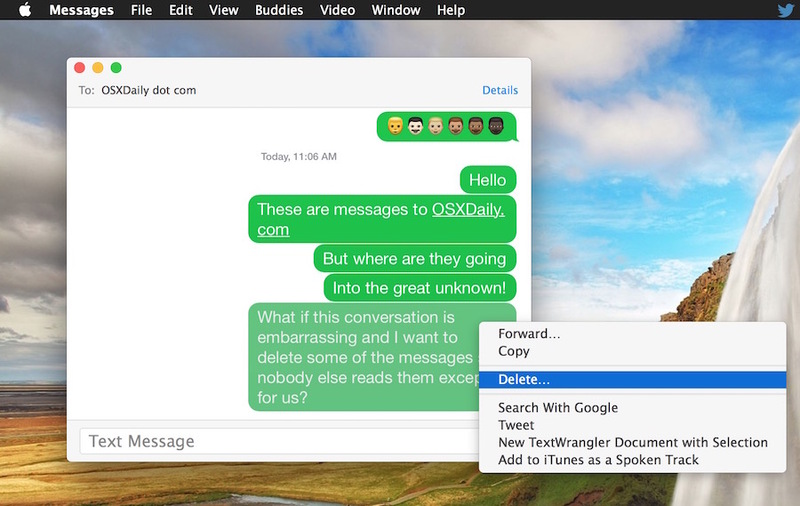 The Mac Messages app allows users to delete portions of a conversation and specific messages contained within a thread, without clearing out the entire chat transcript. This targeted message removal feature is helpful if you want to delete a part of a chat that is best left private, or perhaps because it contains sensitive data, a secret, or maybe it’s just outright embarrassing. 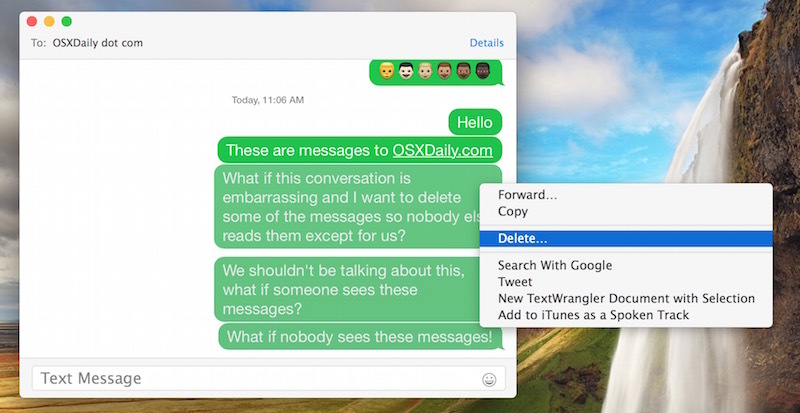 Whatever the reason to remove just a segment of a conversation in Messages for Mac OS X, it’s easy to do, if not completely obvious. By the way, this only impacts the client side of things that is doing the message removal, it has no impact on the recipients messages, as they would need to delete them as well. This can’t be undone (well, unless you reverted from a backup made with the messages, very impractical) so be sure you want to actually delete that message. This often works best if you click on the the color border of the message and not a specific word, which may just highlight the word instead of the entire message. You can delete multimedia like photos and video from within messages this way as well, though since the removal is permanent you’d certainly want to consider saving a picture out of a message thread first if it’s valuable enough to keep around. Note how this is not the same as deleting message chat history caches and logs, which removes all local history of all conversations from the Mac Messages app, and it’s also not the same as clearing individual chat transcripts with a specific person. Those with an iPhone or iPad will find a similar feature exists in the Messages app for iOS, which also allows users to delete specific conversation segments, delete individual pictures or videos, or remove entire message threads. Broadly, I use the delete conversation feature frequently to clear up space. Message cache is enormous with pictures and videos, huge space hog in iOS and Mac. This method no longer works in macOS Sierra as the contextual drop down only provides an option for clearing the whole thread. Now you can just select the specific message and use the DEL key. You will be asked if you want to delete this message only. 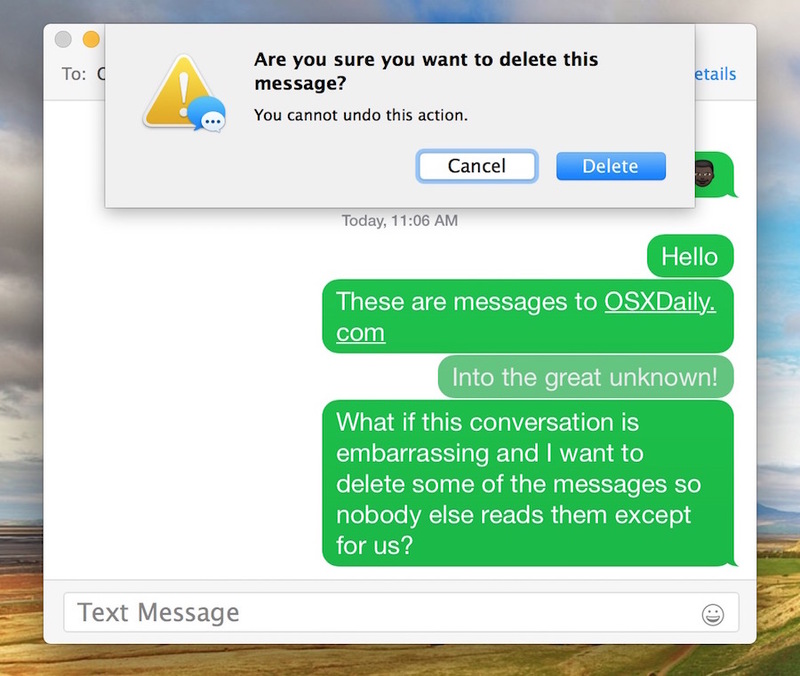 actually, the command click thing to delete messages still works, even in macOS sierra. I can NOT get this to work! I can’t delete a single message on my MacBook pro. It won’t delete right clicking, or using the delete button. I highlight the text in the bubble, I click on the corner, it doesn’t work. Can anyone help? highlight one message within a conversation. Then press delete. ONLY delete and you get a message do you want to delete this message. Press yes and it will b deleted. If you press option + delete you lose the entire conversation. Command delete will not erase one specific message on Sierra but will erase entire message.yes, option+delete will also delete just the highlighted message. It is so much easier on I phone. Why do the guru’s come up with such convoluted solutions and not make the straightforward and easy to remember? On iPhone you press more and then little circles show up and you can check the ones to delete. Why not do this on the computer too? PS. Also, you can highlight more than one single message by highlighting one and the pressing the command key and while holding it down pick another message to highlight. Then you can press option +delete or just delete and the highlighted messages will be removed.